Those of us who work office jobs spend hours each day staring at a computer screen. This unavoidable, uninterrupted screen time can cause eye strain and headaches. For some people, periodically looking away from their computer screen reduces these negative side effects. Others require a more advanced solution. In this article, we’ll take a look at solutions for minimizing screen-induced eye strain and headaches, including glare reduction window film. Several products offer glare reduction qualities. The first and most common product is window blinds. Blinds can be lowered and angled to control the amount of sunlight entering a space. While blinds reduce glare on computer screens, they also limit beneficial natural light. In an office environment, employees who do not suffer from computer vision syndrome (CVS) likely prefer open blinds due to sunlight’s ability to boost mood, creativity, and productivity. With blinds as your glare reduction solution, keeping all employees happy and comfortable proves to be a challenge. The second potential solution to reduce glare in an office environment is light shelves. Light shelves perpendicularly intersect a window’s glass plane and redirect sunlight toward the ceiling. This redirection of sunlight reduces computer screen glare while still allowing natural light into your office. The primary issues with light shelves is that they are highly visible and provide little aesthetic appeal to a space. Computer hoods block light from your computer screen. You can purchase a computer hood online or construct one from a cardboard box. This solution is cumbersome and only works when the light producing the glare is not directly behind the computer user. If you have the ability to move the location of your work station throughout the day as light enters your office at different angles, this could be an answer to your problem. If not, a computer hood is not a sustainable solution. Glare reduction window film offers the most functional and aesthetically pleasing solution to minimizing glare across your computer screen. This window film is nearly invisible, allowing you to maintain a clear view from your office windows while still reducing glare for employees with CVS. 3M’s Daylight Redirecting Film channels up to 80% of the natural light entering your office toward the ceiling and away from your computer screen. At the same time, by redirecting the sunlight upward, natural light penetrates deeper into your office which lessens the need for artificial lighting. This saves you up to 52% on your lighting energy bill. 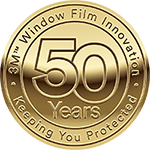 To learn more about how glare reduction window film works, watch this video by 3M about their Daylight Redirecting Film. Curious How Glare Reduction Window Film Can Improve Your Office? Carolina Solar Security is a premium 3M™ Authorized Window Film Dealer in Wilmington, NC. We have been providing Southeastern North Carolina with window tinting solutions like glare reduction window film since 1985 and never stop working to bring our customers the best products paired with the most skilled window film technicians. Reach out to us for your free quote today!